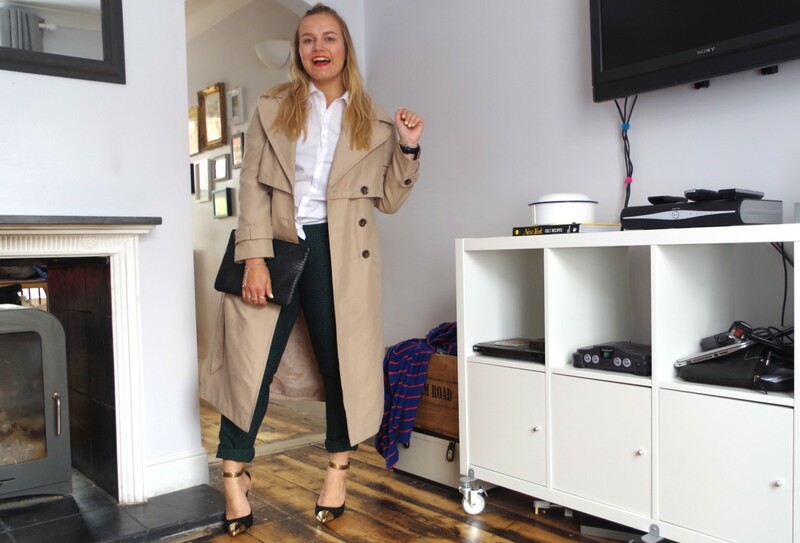 You’ve probs seen me mention my new white shirt either on this blog or on YouTube, because basically, men’s shirts which cost £5 and fit better than my £74867785 women’s ones, deserve to be shouted about, just a bit. Disclaimer: I’ve never actually spent £74867785 on a shirt. Honest. I went for this hunk in a 15 and a half collar (the equivalent of a men’s medium, or so I was told…) in a slim fit from the Tottenham Court Road branch of Primark the other week. It’s a wardrobe trooper – it goes with everything I own and everything you own and you need one, immediately. Although admittedly, next time I might not go for slim fit so that it fits over my curvy lady hips, but if you’re less ahem, round, in the bum area, defs go for the slim fit, it’s an absolute angel. So here’s how I’m styling it up right now. OMG I’m really sorry my writing isn’t all that full of witty corker jokes, my belly is rumbling aggressive at me and it’s taking away all my creative writing juices, FFS. 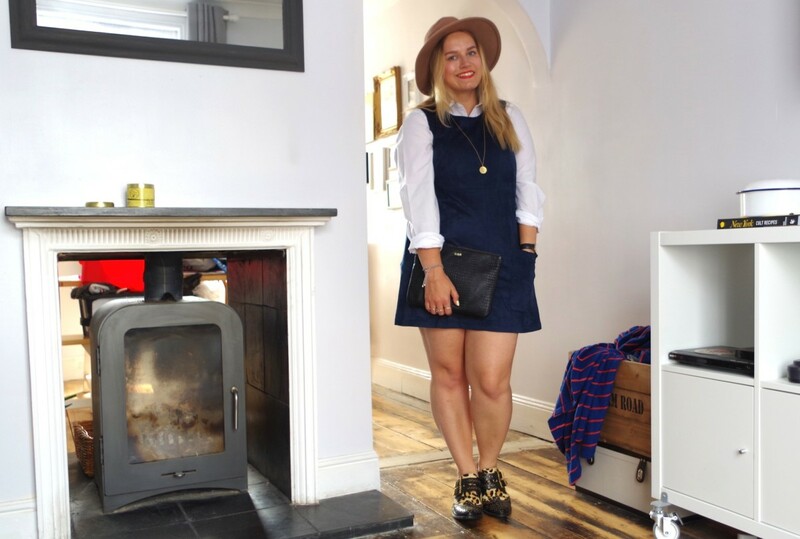 You might already have a denim one peeking out from the back of your wardrobe because they’ve been all over the high street this year, mine however is a faux suede number from New Look, and guess what? IT’S BRAND NEW. It’s really snug and I’m wearing it as I type and I can confirm it’s too snug and warm for 25 degree weather, I’m basically getting a SULA (sweaty upper lip alert for Wild Child virgins…). I love the shape of this because it’s not too clingy on my lunch baby, and also navy = instant winner in a sea of maroon and tan. Bore off maroon and tan, no-one wants you here. This is going to be one of my early autumn go-to outfits for those days where I bother leaving the house. Yup. The truth behind these trousers is that I bought them in 2013 from Miss Selfridge, got bored of them, whacked them in a bin liner destined for the charity shop and then found said bag in the shed at the weekend. They’re now firmly back in my wardrobe, although feeling a lot snugger than I remember them. 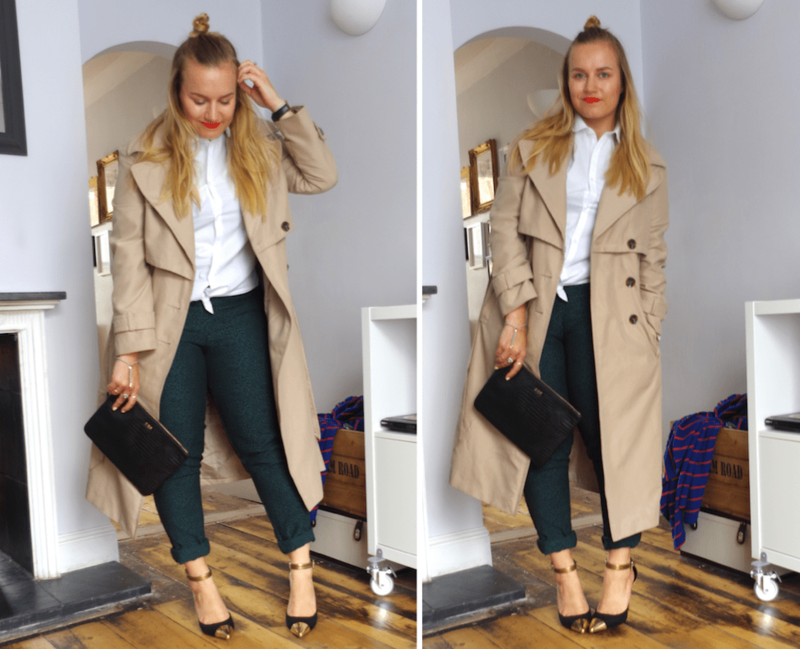 This for me is a dream office outfit – if I were, y’know, to still work in an office that wasn’t next to my bedroom. I’ve tied the shirt up to make it a more flattering fit (and to kinda hide my gunt creeping through) and have teamed with just a plain black pair of heels and trench coat, and if you ain’t already got those staples in your wardrobe, then guuuuurl, you got problems. This is the first time I’ve worn an A-line skirt since last summer without feeling like a bloated sausage about to pop out of its skin. In fact, when I looked back on these photos I was a bit overwhelmed but how chic I looked and how un-stumpy my legs looked. LIKE OMG I LOOK IN PROPORTION AND LIKE I SOMETIMES GO TO THE GYM. This skirt is also a new New Look buy, and because it’s monochrome it’s obvs mega easy to wear – grey sweatshirts, denim shirts, all black tops, all white tops – you get the idea, the style opportunities are endless. I threw in a bright pair of heels to help make my legs look long and sassy and my fave clutch (which sadly, is long gone on the ASOS website, soz). Which is your fave, galdems?